JODIE LOWTHER & A.R.C. SOUNDTRACKS - "The Blow Vol. 4"
The fourth in a series of split releases, The Blow Vol. 4 is a dark, ethereal ride through a gloomy, mystical landscape brought to you by two UK artists, Jodie Lowther and A.R.C Soundtracks. The first side of this record is brought to you by multi-talented musician and artist Jodie Lowther. The music she crafts here in the opening track is cool, dark, and full of esoteric tones and eerie reverbed vocals that haunt the distance. Soft synths create a sense of space and brings to the mind the image of a cold cemetery in the snow, in the twilit shadow of an ancient stone church. Other tracks, such as Hall of Faces pay homage to classic phsycological horror film soundtracks. This heavy-handed piano durge could very well serve as the ending credits after a movie monster kills the protaganist in a surprise closing scene. Lowther uses many techniques to maintain a mood that is as alluring as it is dangerous. Fractured synths transmit broken signals as mischievous imps play twisted harps. Unearthly echoing voices drift in and out of the mist. The track Delirium Sea introduces a rhythmic beat, but still is backed by a spooky atmospheric humidity, damp and cavelike in its timbre. The final piece, entitled The Occasional Sleeper, is an unsettling descent into a world surrounded by unnatural beings. A broken bell's toll is muted in the distance - as a final effort to call out to the listener before being swept away in the spiritual currents. Though there is a slight contrast in production and tone between the first and second side of The Blow vol 4, the spirit of the overall release still holds. On this half of The Blow, A.R.C. Soundtracks provides a sidelong track called Taken Up and Dissolved - which is a half hour journey through an otherworldy realm. 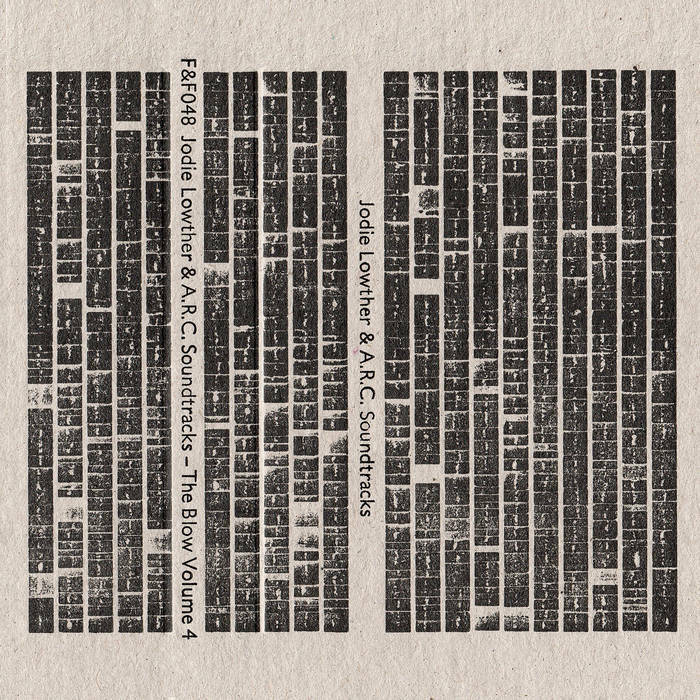 If it could be said that Jodie Lowther's side of this project represents a bleak landscape haunted by the dead, A.R.C's musical contribution is more from the perspective of the haunters themselves. This is a formless, weightless movement through a number of sonic zones. Ghostly voices, echoed soliloquy, and distant instruments punctuate the ambient heaviness. Theres a great, deeply ominous bass hit about six minutes in, which repeats and creates a shadowy tone that penetrates the soul and propels the listener forward through the hazy purgatory - at last coming to rest on an uneasy island in still water, surrounded by gray expanses of foggy sky. The Blow Vol. 4 is an excellent representation of what a split release can deliver - a strong central theme that carries throughout, bolstered by the creative similarities and differences between the artists. Newer PostPET - "Ten Thousand Years"